Let’s explore fetal engagement in detail. The widest part of the baby’s head is the parietal eminence. You can feel your own parietal emininence as a soft “corner” on the top and outside edge of your head. As the broad ligament, wrapping the uterus, softens at the end of pregnancy, the baby lowers in the abdomen. Lowering in the uterus curls baby up, creating flexion. Now baby’s head can fit beneath the sacral promontory. 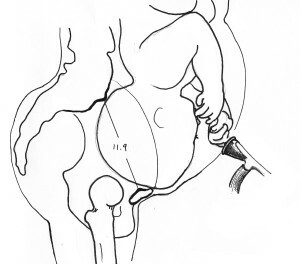 Which one or both parietal eminence(s) of the baby enters the pelvic brim or inlet depends on baby’s starting position. When will a first baby engage? Once considered two weeks before the due date, at 38 weeks gestation, engagement can wait until uterine surges (contractions) bring the baby into flexion and rotate, if necessary, to fit the head into the brim. The baby remains high in the pelvis, even at 10 cm dilation. 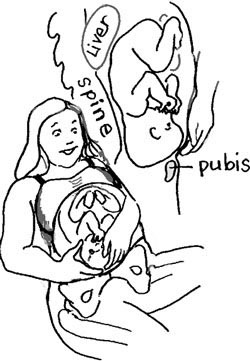 Adding power to the contractions may just push the baby’s head against the pubic bone. Rebozo Sifting as described here. Sidelying Release as described here. Standing Sacral Release as described here. Therapeutic massage by someone who knows pregnancy and pelvis like a star! This list may make sense to a body worker and seem strange to the average birth worker. Since the body is joined as one functioning unity with connective tissue and fascia (related tissue) it makes since to ‘release’ tension or torsion in areas that, though far from the pelvis, effect the pelvic alignment and flexibility. Baby has to get into the pelvis in order to go through the pelvis. Engagement happens when 4/5ths of the baby’s head is in the pelvis. The head is no longer ballotable; it can no longer be wiggled between the midwife or doctor’s fingers. However, the Direct Occiput Posterior or Right Occiput Posterior babies can have the dome of their head in the pelvis with their foreheads sitting on the pubic bone. Flexion makes this less likely when the baby is Left Occiput Posterior (Sutton). Jean Sutton wrote that a first-time mother has a pear-shaped uterus compared to the apple-shaped uterus of the experienced mother. (Sutton). 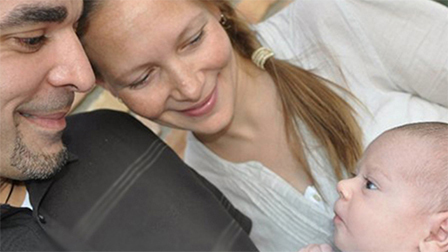 An experienced mother’s baby may not need to engage. If baby isn’t posterior and earlier labors have gone well, don’t worry about it. Labor will engage baby. A mother who had to have her first baby by cesarean because baby remained high will be more likely to have a natural birth if her subsequent babies engage. A breech baby may engage when the uterus allows the hips of the baby to lower beneath the level of the pelvic brim. Why wouldn’t a baby engage? A baby in any head position that is not flexed (chin tucked) has a head that seems bigger and can even overlap the pelvic brim. More frequently than commonly discussed, the Occiput Posterior baby’s head overlaps the pubic bone (unfavorable diameter) which is discussed in medical literature. The head is too big for the pelvis. CephaloPelvic Disporportion (CPD) might be caused by rickets, injury, or an actually too-big-baby. CPD is rare, but does exist. The pelvis may be small or seem to small because the pelvic brim is misshapen because of malnutrition during the formative years. Low levels of Vitamin D-3 may be one cause. Personally, I don’t suspect CPD in pregnancy if baby isn’t engaged until baby is LOA or LOT and in one of those ideal starting postions, can’t engage. This mother will have also had bodywork specific to aligning her pelvis and releasing her sacrum. Some women will need to release a tight psoas to let baby descend into the pelvis. It would be quite rare to have a placenta blocking baby’s way and preventing engagement. The soft tissue issues of a twist in the lower uterine segment from the above list is more common. A tight psoas can be another cause. Sometimes a mother or a mother and her provider can do what is needed to help baby engage before or during labor. Sometimes a bodyworker is best for a particular situation. Baby is not due yet! Make sure the baby is really 40-41.5 weeks before considering the baby “due.” Doctors and Midwives often say about 37 weeks gestation that “baby can come anytime.” Don’t confuse lung maturity with complete birth readiness. Many babies don’t engage if they aren’t 38 weeks or later in gestation in a first-time mother. This is normal. Check the dates. It is not uncommon that a second, third or more baby to remain high and unengaged. Perhaps this is because the mother’s uterus is now apple shaped instead of pear shaped and baby is not aimed by the uterus into engagement. That’s a theory. Lack of engagment is not usually a problem, especially if the mother has birthed vaginally before this pregnancy. We would decide to intervene if the first labor was difficult and this baby was posterior. Many occiput posterior babies don’t engage before labor starts. Helping baby rotate to engage often allows labor to start -if baby is mature and ready to be born! At 41.5 weeks, most anterior babies have been born. Some families have a tendency to carry babies long. Check to see baby’s position before assuming the oven bakes slowly. When the baby is in the posterior position, help baby rotate by the same balancing techniques listed above. When a posterior baby engages, any issue with fitting the pelvis shows up as the baby tries to move down. Softening the muscles and lengthening the ligaments with the Sidelying Release and other static stretch techniques can make a difference between vaginal birth or needing a cesarean. An inversion during labor may back baby up out of the pelvis very slightly and allow the uterine contractions to rotate baby and keep baby head down to engage in a better position to fit the pelvis. See Open Knee Chest. Since less posterior babies can tuck their chin, due to extension of their back, helping the posterior baby to tuck their chin with the Abdominal Lift and Tuck may help them engage. Labor may actually help baby rotate to the mother’s left so they can engage. Use the balancing activities to increase the chance of rotation. Pelvic shape seems to determine whether fetal position matters for a particular woman. In general, fetal position does matter. Those women who have a gynecoid pelvis, wider side to side than front to back, seem to have babies engage with the most ease when baby’s occiput is on the left (see Belly Mapping to understand fetal positions). The Left Occiput baby aims his or her crown into the brim. Being flexed is what puts the crown in first. Only 5% of women have a platypelloid pelvis, with such a narrow front-to-back diameter (distance) from pubic bone to sacral promontory that baby must come down from the mother’s left side to engage. A third to nearly half of women have a long front-to-back anthropoid pelvis inlet and then either the direct posterior or direct anterior baby can engage and will do so if the laboring woman can move her pelvic brim angle to the best advantage. A birth stool or standing and leaning forward (over a counter or dresser) seems to help engagement. A woman whose sacrum is sharply angled may have hours of labor before her baby engages. This woman will have a “sacral bustle” or a “ledge” on the top of her bum. To describe this, I say she could set a glass of water on this ledge, which isn’t really true, but gives the picture. Standing and leaning forward with contractions, in early to active labor is usually what these women do naturally and usually helps engagement. If not, a birthing stool or the abdominal lift and tuck usually brings the baby into the pelvis. From there, the labor usually proceeds rather quickly, as the mother’s hormones are well primed by the long, strong early labor. 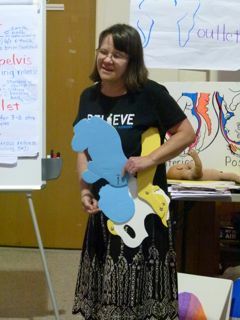 Gail shows the posterior positioned baby resting on the mother’s pubic bone at a Spinning Babies Workshop in San Diego, California. Circa 2009. What happens if the baby doesn’t engage before labor? Reasons depend on the reason and how easily it is to help baby engage. Sometimes labor seems late to start because the baby isn’t able to enter the pelvis. Check baby’s position and assist chin flexion and rotation to the LOT or LOA position if possible. Labor may also start before baby engages. When labor does start, contractions can be strong without much dilation and the baby remains high in the pelvis. Before the cervix opens well, we need to help baby come down into the pelvis well. Preparing for an induction by increasing balance may rarely let labor begin on its own that night before the induction is to begin, or may help the induction be easier. Mothers themselves might print and carry in some pages on engagement in their birth bag. These engaging activities can be done before labor. All these activities work on balancing the muscles, ligaments, pelvic joints, and resolving tight psoas issues. The more the merrier since we don’t know which muscles and ligaments may be tight. Pain is not the only indicator. Balancing techniques will not cause an anterior baby to turn posterior. Balance helps make room in the pelvis and reduces tight spots to allow baby the best chance to rotate. Who might be more likely to have their baby not engage until labor or at all? An older woman with an android pelvis and a posterior baby who is larger than average size and who labors in bed. Any one or more of these conditions may reduce labor progress because baby is not yet in the pelvis. A slow metabolism shown by higher BMI or low thyroid is a compounding factor, making any of the listed issues more likely to effect labor. A woman with one or more of these factors may benefit from bodywork specific to aligning her pelvis and releasing her sacrum. Some women will need to release a tight psoas to let baby descend into the pelvis. Improving metabolism early in pregnancy increases success. If a baby doesn’t engage, should we assume baby is posterior? If baby hasn’t engaged in a first time mother by 38 weeks we might check more carefully for either occiput posterior presentation or to be sure dating of the pregnancy is correct. Listen to the actual signs and symptoms in pregnancy of fetal position. A woman often feels little fingers wiggling between her pubic bone and her navel on both sides of her linea nigra when baby is posterior. If we think baby is posterior and baby is not, these techniques will not move the anterior baby out of a good starting position. For a woman in labor, check out information and techniques to help the baby engage.